There is something about the energy of a new year that drives us to make resolutions to make positive changes in our lives. Many people opt to make one about living a healthier lifestyle, but it can be difficult to know how to go about this. 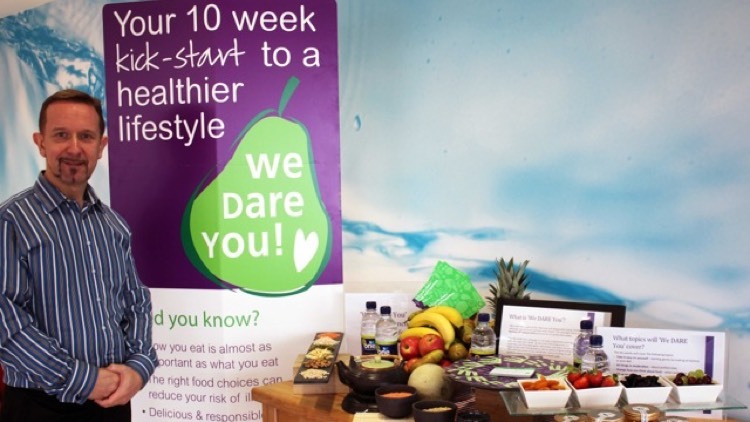 It was for this reason that at the beginning of this year we launched a ‘We DARE You’ 10 week campaign complete with banners, stickers, loyalty cards and information postcards for our customers to help guide them through this process. DARE (Delicious And Responsible Eating) is something that we run year round at bartlett mitchell, with our customers really enjoying reading the different health and food related postcards. The 10-week campaign covered a number of topics from ingredients, to portion size, to exercise at work and the response has been tremendous. Eight years ago, when we first launched our DARE programme, the social media world was still in its infancy but this year we were able to use LinkedIn to launch a questions forum for every one of our customers to use. Our nutritionist, Penny Hunking, answered any questions any of our customers had posted and we plan to continue this service throughout the year. If you want to join our group search ‘bartlett mitchell: healthy eating at work’ or follow this link. What was particularly wonderful to see was how engaged our teams were. Each week the menus were adapted to include special dishes using ingredients featured for that week and our staff gave out recipes and information cards to support the dishes. Some of our restaurants even researched 5 different 1-mile walks from their kitchens and created healthy snack bags for before or after the journey. How entrepreneurial is that? Of course the greatest joy was to see the many different displays and activities our teams arranged, some of which we have shared on our Facebook page. I’ve included one picture of our hestia table and if you want to find out more about DARE then take a look here.